This is a post I've been meaning to write for a long time. One reason is that I get asked a lot what brand a certain tool/block is and where to buy it; another is that I truly believe in the power of sharing resources and techniques. Also, if more people try out printmaking after learning from my experience and mistakes, I'm sure printmaking materials and supplies will be more widely available (especially in Sweden) too. This is not a sponsored post. I will specify which suppliers I have purchased before, as well as mention some others that I know of. My description will be based on my personal experience and my knowledge of their stock. I will cover both Swedish and international, both online and physical shops. This article is meant to share where I buy my printmaking supplies, so based on where you live, you might find suppliers that carry a larger stock, offer lower prices/shipping, or work better for your needs for some other reason. Click images to enlarge them, and on the suppliers' names to visit their websites. I use a wide range of materials for my linocuts and rubber stamps and I frequently buy from these suppliers below, in a rough order of how often and much I buy from them. Speedball Speedy Carve. This is the pink rubber you see a lot on my Instagram; great for stamps: it's soft so easy to print by hand. Jack Richeson Easy to Cut Linoleum. It comes unmounted and is butter-smooth to carve; can be used in place of traditional Battleship gray linoleum. Too hard to use for stamps, but prints perfectly for linocuts. OZ Kut. White rubber I've been using for some stamps. A bit harder and thicker than Speedy Carve. Artistica.nu - Sweden, online. The only Swedish shop I found that carries the green Japanese vinyl blocks. 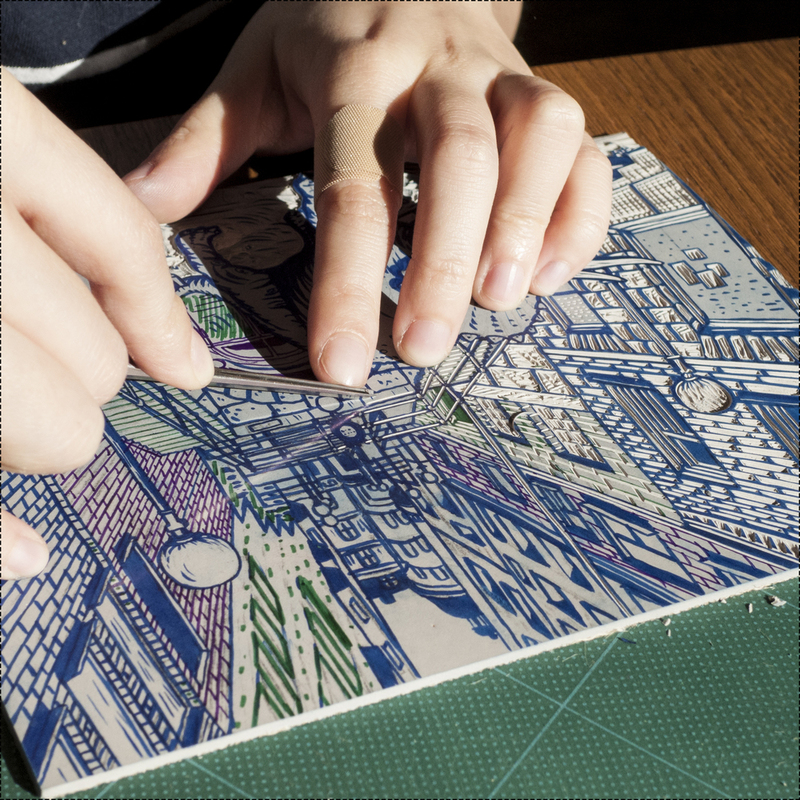 The material is softer than traditional linoleum, takes details beautifully and can be carved on both sides, but it's hard to get a clear pencil transfer of the design, and to see the design clearly when you carve. IB Wahlström - Sweden, online and physical shop (Olofsgatan 10). They carry traditional gray lino as well as Adigraf, an Italian carving material that's very soft and rubbery. Swedish schools use this a lot in art classes. Fairly easy to carve, but hard to get fine details. This shop also has other beginner-level carving blocks, most of which I have tried and wouldn't recommend. Jackson's Art Supplies - UK, online and physical shop. I buy my Pfeil tools here. There are some Swedish web shops that have Pfeil (Boesner, Slöjd-detailjer, Holm Trävaror), but I have yet to purchase from any of them. I also use gouge with sets of blades from Speedball and Esdee; both I highly recommend to beginner and intermediate printmakers. I believe I bought mine from Stampeaz and IB Wahlström respectively, but they are rather popular so you should be able to find them in other online shops. Hyvlar.se - Sweden, online. If you have gouges like Pfeil that needs more maintenance and sharpening, the Flexcut Slip Strope sharpening system works very well. Hyvlar is the shop where I got mine; you'll be also able to find it in art supply shops as well as carpentry shops. I'm not gonna write about scalpels this time for two reasons. One, I don't use scalpels a lot for linocuts and two, I find the grip and the angle of the blade more important that the brand or model, so if you are starting with rubber stamps or carving softer materials, you should be able to find a scalpel that works nicely in your local stationary or craft supply place. IB Wahlström - Sweden, online and physical shop (Olofsgatan 10). I buy most of my papers here: Hosho, Yamashiro and Chinese mulberry paper. Konstnärernas centralköp - Sweden, online and physical shop (Fiskargatan 1A). They also carry Japanese and Chinese mulberry paper. If you don't live in Sweden, your local art supply shops should carry some Japanese paper. Hosho is thicker and great to work with (be sure to print on the smooth side); Yamashiro and Chinese mulberry are much lighter and have beautiful fiber-y textures. After a long phase of experimenting and frustration I now stick to Caligo Safewash Inks and I buy them from Jackson's Art Supplies. These inks are "oil-based but they can be washed away safely with liquid hand soap and water". There are other things you might need like a sheet of non-slip mat, cut proof gloves (I use disposable rubber gloves when I start to sweat), carbon paper (for transfering the design onto the block), Japanese brush pen or marker pens to draw the design, ect.. You'll be able to find all of them on Ebay, Amazon, or your local shops. That's all I can think of for now! 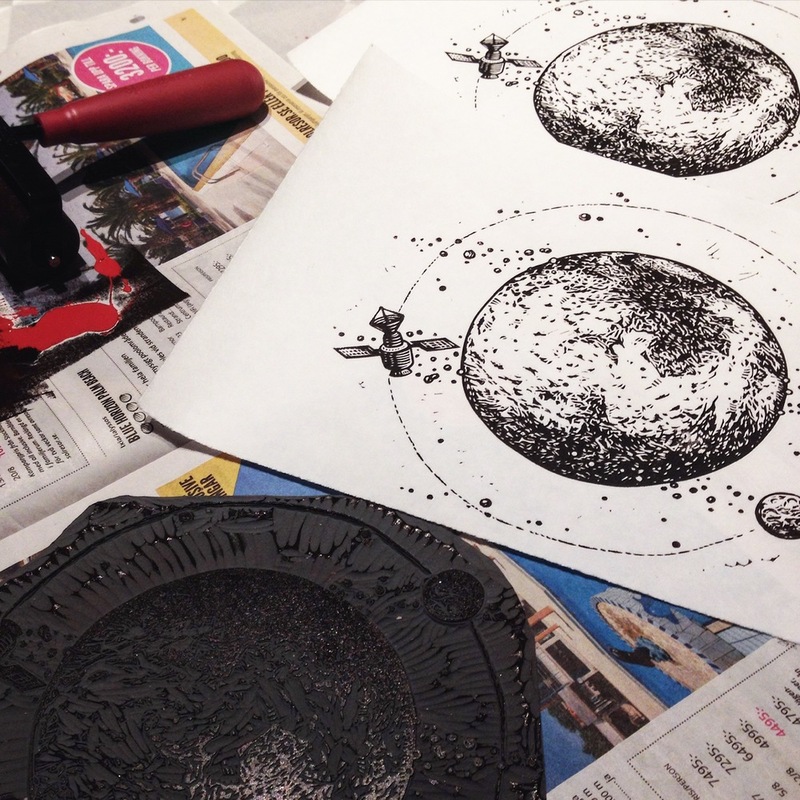 This article focuses more on linocut than stamp-making; for the latter you can check out my previous blog post on stamp-making tools and materials. It took a while to complete this print - I was moving studios, and in a length pursuit in finding the perfect paper to print on, one that both looks great and is easy to tear into the cut/tear into the sizes I usually work with. Luckily, everything was sorted out and I have two new linocuts to show you, Reeled In and Trotty. I'll put some pictures of the making of the first one now, and then make another post about the bird print. This print features four Swedish fishes: abborre (European pirch), alaska pollock/torskfisk (a kind of cod), sjurygg (lumpfish or lumpsucker) and gädda (pike). It started - as usual - with a pencil sketch. I've been quite happy with this A4-sized lino and I've been sketching on printer paper. I transferred the outline to the lino with carbon paper, then started drawing the details with markers. Onto carving. I've been making the stamps during weekdays and carving linoleum over the weekend, so this usually happens on our coffee table. Our fluffy friend has taken a special interest in this linocut. After a few morning's carving, the fish completed is ready for proofing. I am rolling on a generous layer of the Caligo oil-based ink to get a nice rich black especially on the sjurygg. Look at the velvety ink! Here's the first proof. I marked the places that need a little tweaking. This is A4 printer paper. 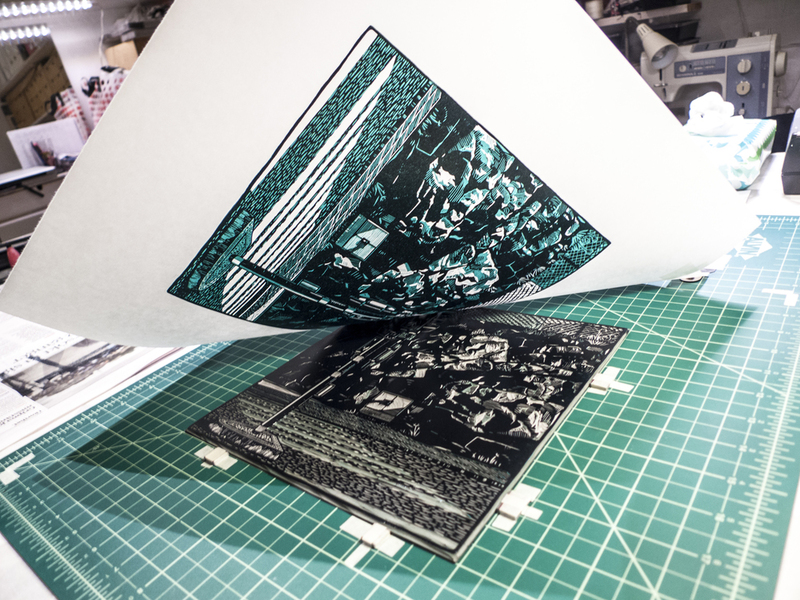 Printing the final edition on handmade mulberry paper. It's very light but has strong fibers and beautiful texture. This metal postcard mobile has been very helpful for drying prints! I taped little paper pads on the toothy clamps to protect the printing paper. A close-up on the pike. Anyway, this is a limited edition of 10, all hand-printed and signed at the bottom with the edition number. You can purchase it in my shop; and in my next post I'll share the process of Trotty, a smaller print with a white wagtail. I asked everyone on my Facebook page what they wanted to know about my work (here's the post; questions are in the comments) - stamp-making, printmaking and selling your work online. I started my business "this is just to say" stamps back in May, 2010 - it's definitely been a learning process. From taking nice product pictures, managing listings to social media marketing and website-building (yes, I made my own website! ), the most important lesson is that freelance means more freedom AND more responsibility. 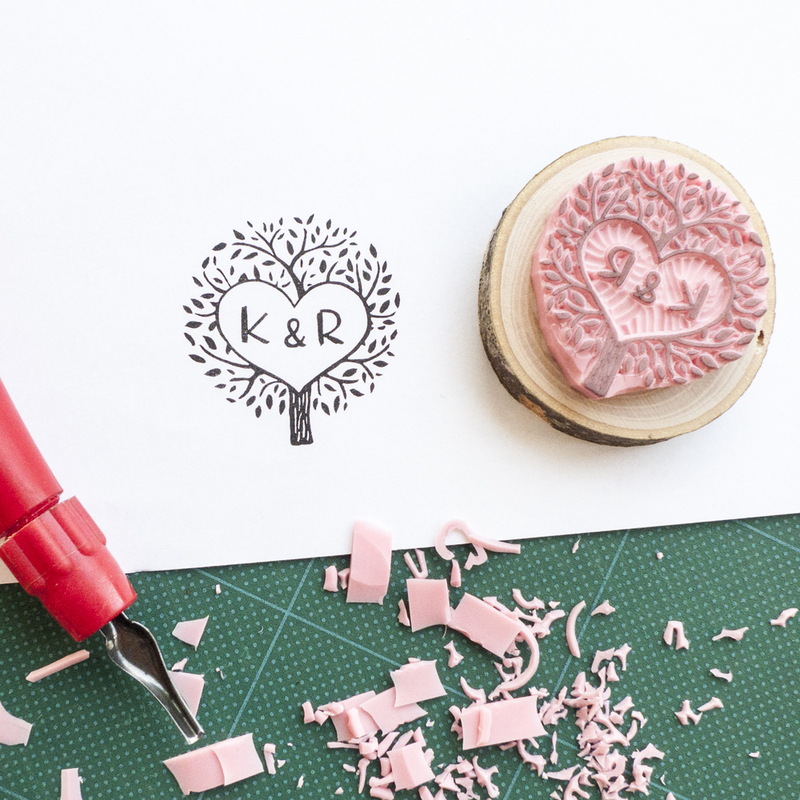 In this post I will only be answering the questions about rubber stamp-making, but not about marketing and e-commerce - the latter I will get to in another post in the near future. So, without further ado, these are the questions you guys sent me on Facebook, and my answers to them. Xaviera, you make very nice stamps! I have tried no less than 20 types of carving materials and have narrowed down to two I now use for most of my stamps: Speedball's Speedy Carve (the pink ones below; for most of my recent stamps I use this) and a two-layer carving block by Seed, a Japanese brand (the black one in the center; example is this stamp). Speedy Carve comes in many different sizes and I usually get the 4" x 6" or the 6" x 12". Speedy Carve's new version (the darker pink one on top) feels a little more rubber-y than the old lighter pink version. The new one gives a bit more resistance when carved. I like the old one better - the difference is minimal though. Speedy Carve is widely available in craft stores and online. Seed's two-layer block is probably the most enjoyable rubber block to carve. 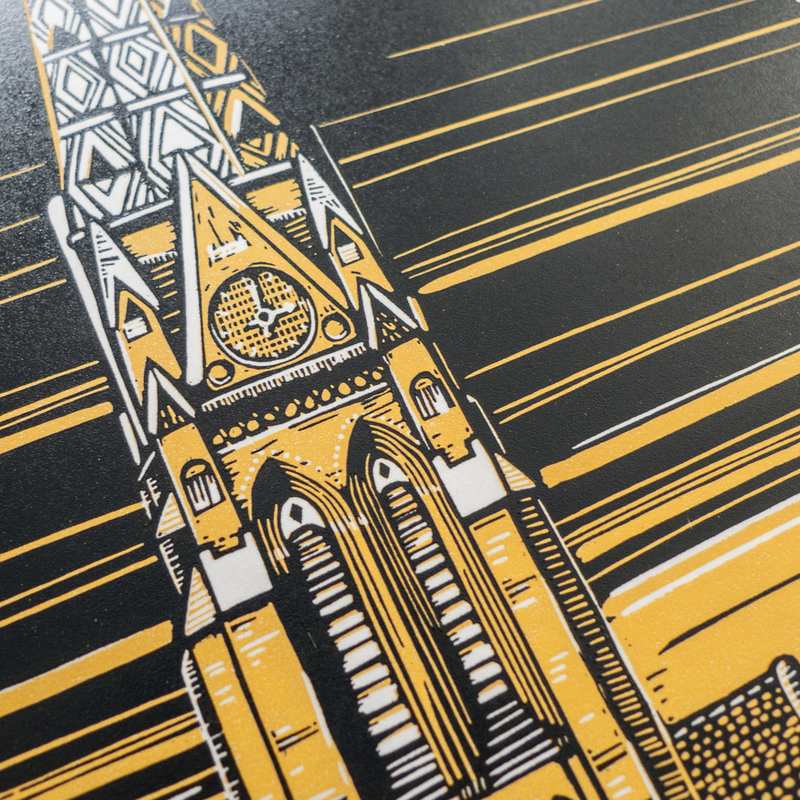 The smooth texture makes it cut like butter, and the color contrast gives stamps an interesting touch. Despite how well it carves, this block has two disadvantages. The first is that its fine texture means that it's not really as sturdy as Speedy Carve; if you are making a stamp with very fine lines or small dots, Speedy Carve will be a better choice. The other drawback is that it's only manufactured in Japan and shipping cost to anywhere else in the world could exceed the price of the blocks. Because of its smooth surface and the plastic packaging, every Seed block is covered in a thin coat of fine powdery substance fresh out of the pack. 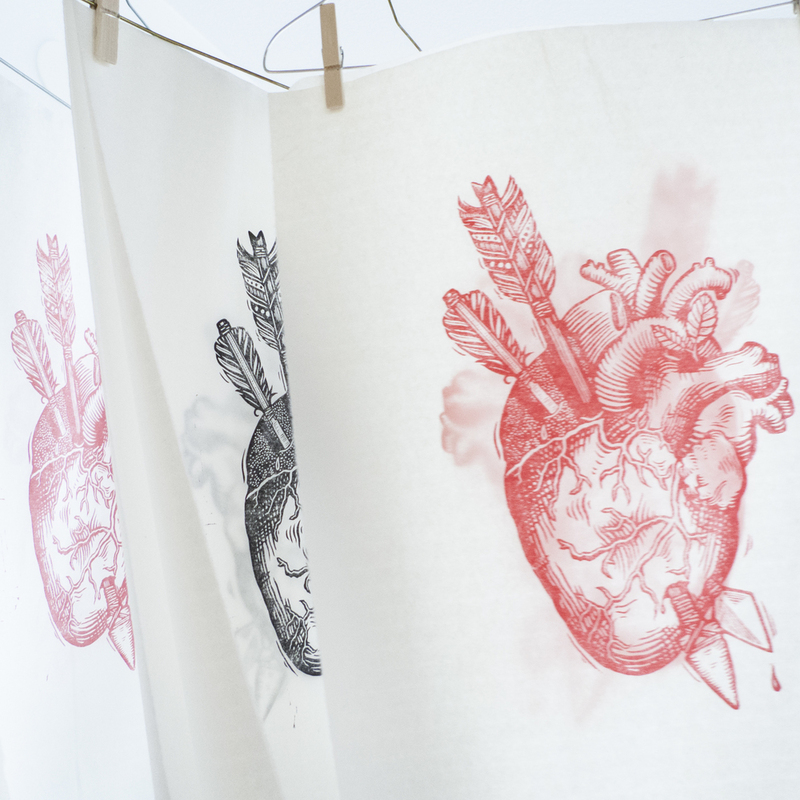 I wipe mine with a damp kitchen tissue before transferring the image. Seed blocks' surface also takes pencil & acid paper transfer better than Speedy Carve, but it's easier to clean pencil residue from Speedy Carve blocks afterwards. These blocks comes in many different colors and textures, including limited designer versions with special color combinations. My favorite is the black/white one and the cream/white one (top right on the second picture below) which have the densest texture in the collection. So, Speedy Carve is still my go-to carving material when I make rubber stamps; I do like to keep some Seed blocks at hand which I use for mostly for small unmounted stamps. I'm also constantly finding and trying out new carving materials! Here are some I just got in the mail from Blick Art Supplies (ignore the Seed block I forgot to put aside), including the crazy-/awesome-looking Blüm clear block. Most of the new materials I have used and the ones in the picture below are printmaking materials though, so it's rather difficult - if possible - to reach the rubber-stamp level of intricacy/details with them. P. S. If you know of a carving material you'd like to recommend or would me to review or, please leave a message - I would love to know! Thanks, Guchun, and welcome to stamp-carving! I'll go into some detail about carving tools now. I have more than 10 knives but I have some on exhibit in Nordic Design Collective's pop-up store, so I'll only talk about the four knives I primarily use now. From left to right, they are: Essdee Small Plastic Linoleum Cutter, Speedball Linoleum Cutter, NT Cutter white D-401 P and NT Cutter A-300GRP. Both Essdee and Speedball come with multiple blades, but I'm mostly using Essdee's big V-gouge and Speedball's #1 blade, which is a small V gouge. 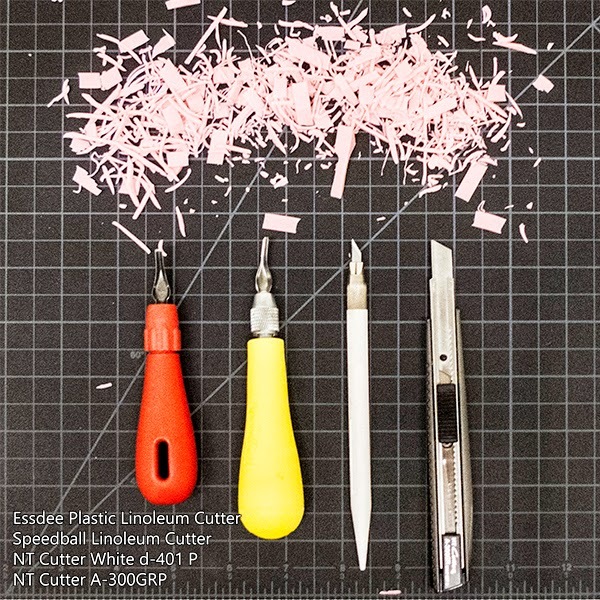 Speedball's Linoleum Cutter is quite nice for rubber stamp-making - you can pick from a whole range of different blades and keep them in the "belly" part of the handle. You can't do that with the red Essdee which really doesn't have any outstanding merit except for the fact it's really small and light to hold; it works well with my small hands. Here is a new stamp I made recently with almost only Speedball's #1 gouge, except for the text part where I used the NT scalpel. I find that small text easily break if you carve them with a gouge. Among the couple of scalpels I own, this NT Cutter is my favorite. It comes in a variety of pastel colors - and white. You don't have to go out of your way to get a Japanese scalpel though; you'll most likely find a regular x-acto scalpel or something similar in your local craft store, and as long as you change the blade rather often and see to it that it's sharp, it'll work just as well. You'll also notice that some scalpel blades vary in lengths and the angle of the blade, but I think it's a matter of personal preference. Then it's the NT Cutter A-300GRP, I cut bigger rubber pieces and trim off the extra part of stamps with this; you can substitute it with any snap-off light-duty utility knife. Although I like all four knives very much, the brand or model matters less than how sharp your knives are. They'll make carving not only more enjoyable but also safer - same reason why chefs always stress the importance of sharp knives in the kitchen. Here's a close-up of the four knives. As for the wood mount, I use all kinds of tree branch slices and unfinished wood pieces. For the wood branches, any wood with a dense texture and light-colored cross-section cut will take ink nicely - that is, if you want to print the stamp on the back of the mount (there are a lot of pictures here on my blog). I use everything including oak, tilia/linden, maple, birch, cherry, etc.. If you are using a type of wood for the first time, it's a good idea to take test print a little and see how your ink and wood work together - if the imprint will smudge or blot/spread along the wood grain. If the surface of the wood is very smooth or you are really worried that it'll smudge, try spray a watercolor fixative on top. Make sure to do it in a well-ventilated area though. I use 1cm tall wood slices that are dried and hand-sawn and hand-sanded. That should cover the carving materials and tools! Again, let me know if you'd like me to review anything, or if you have a question about anything I mentioned above. Thanks, Laura! I've had a few questions about carving small details and texts and I would like to make a video tutorial/guide sometime. But there's one technique that you might find helpful - when carving small details like small dots or inside of a letter, instead of adjusting the angle of your knife, try turning the stamp with your non-carving hand instead. This way your knife doesn't have to move; you'll get nicer details and cleaner curves. Hey Alicia! Hope it's ok - I'll address e-commerce and marketing in my next blog post. As for your next question - I'm not sure what textured surface you have in mind, but here I've written a little about ink pads. I'm not sure what kind of textured surface you have in mind, but an archival ink is a good idea. I don't think how fast the ink dries necessarily has to do with how the final result is; but you'll certainly get very different results with regular ink vs. embossing so it's rather difficult to compare these two. Hi Joe! Like I told you on Facebook, I've almost never printed on fabric, but if you have a similar question, check out this post and the first - Captain Nemo's - comment. She mentioned Palette from Stewart´s Superior and attached a picture; you'll find it very helpful. Update 2014/1/8: Allison on Facebook commented here about using acrylic fabric paint on rubber stamps. So, that's about it! I want to say thank you to all of you who liked and commented on my Facebook page! I would love to share with you what I do and it really helps to know what you want to read about. 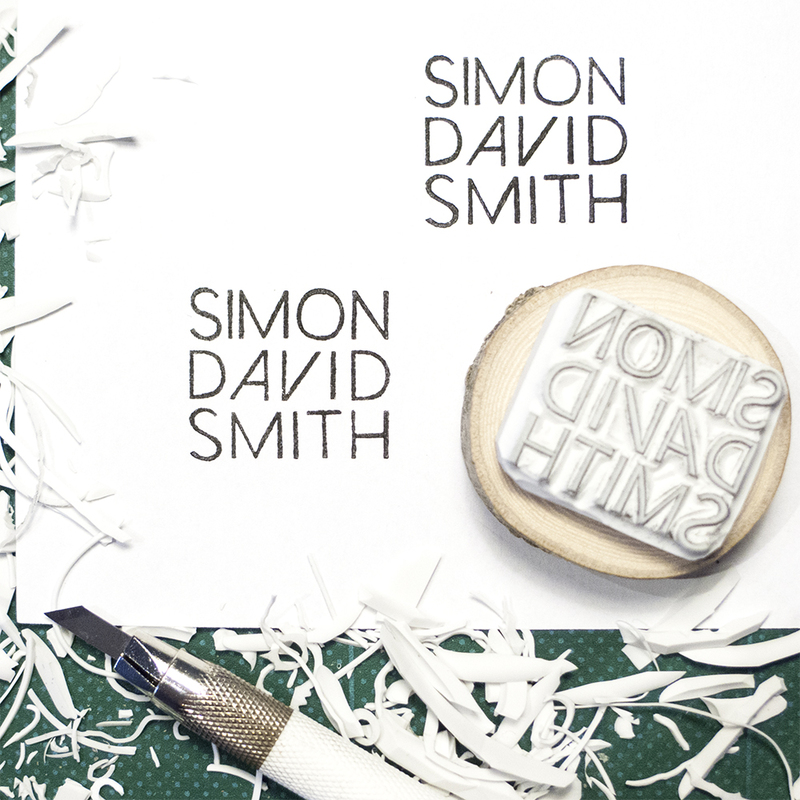 I love working typography into my stamp designs. When I get requests for custom stamps, I sometimes get asked "are there fonts you recommend?" which I find hard to answer, most because fonts are like us and each one of them is so uniquely different! I decide to make this image (go chalkboard typography!) to show you some of my favorite fonts as well as give a nod of the head to some of the cinematic classics. Like I said, the fonts are all free, and if you click on the source address below the image you can go to the download page where you'll also be able to preview custom text in that pretty font. Leave a message and share your favorite font and quote!